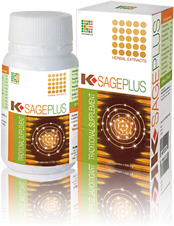 K-Sage Plus is the essence of natural plants that are specially selected and processed through advanced extraction technology. There are varieties of free amino acids and small molecules of polypeptide that are contained in K-Sage Plus, which are supplements needed for varieties of physiology function for the body, memory and cerebrum function. Nerve cell culture experiment and consumption of K-Sage Plus by hundred thousands of people have proven its effectiveness. Its efficacy in providing protection and monitoring damaged brain nerve cells that lacks blood and oxygen are approximately 93% when consuming K-Sage Plus. The effect on regeneration of the central nerve cells was 63.9%. K-Sage Plus is also effective on activating neuron, restoring damaged nerve cells, mental disability that is caused by the growth retardation of the central nerve cells. For the aging nerve cells of the middle and old age, K-Sage Plus helps in two main areas, namely, assist in treating and in maintaining health. Besides helping to activate brain cells and improving memory, K-Sage Plus also helps to lessen the incidence of Parkinson's Disease, senile dementia and at the same time helps to increase work progress. K-Sage Plus, which applies modern biological techniques, is one of the great successes of new products utilizing advanced technology.